Nearly 300 trail runners from around the United States will be competing on a beautiful course with sweeping views of the TN River Gorge and the Raccoon Mountain Reservoir. When you get to the TVA Road, you follow it up to the gates to the facility. From there you will see signs directing you to Laurel Point. Rock/Creek and the Vasque Project proudly present the third annual Scenic City Trail Marathon & 1/2 Marathon, taking place at TVA’s Raccoon Mountain Pumped Storage Facility on the trails developed by SORBA-Chattanooga this Saturday. Both of these trail runs begin at 8:00 a.m. EST. Race-day registration and check-in will open at 7 a.m. The race begins and ends at the Laurel Point Parking Lot. This increasingly popular Chattanooga race will be a stunning display of several hundred runners’ determination to conquer fast and lenient trails, while posing the challenge of the imminent Course Record. Racers from 10 different states will be witness to beautiful landscapes, pristine forests and incredible community as a part of Rock/Creek’s Trail Series. “With 270 runners currently signed up to race, this now eclipses the 8-year-old Rock/Creek River Gorge Trail Race in participation, and becomes our second largest event after the StumpJump. I’m impressed with the level of commitment shown by the trail running community, as well as the many first-time trail runners I’ve heard from, people who are willing to move off the roads and try something new,” explains Mark McKnight, one of the event organizers. The Scenic City Trail Marathon is a journey for all runners, weather a beginner or an ultra fast runner aiming for the course record. 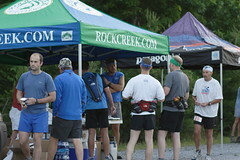 This year’s event includes a running clinic Friday night at Rock/Creek’s Two North Shore location. The presenter will be world class trail runner Shiloh Mielke. Sponsors for the race include: Rock/Creek, Vasque Project, Marmot, Hammer Nutrition, The North Face, SmartWool, Greenlife Grocery, and Toyota of Cleveland. Participants who pre-registered will receive a technical tshirt from Marmot. Prizes and raffles will be provided as well. 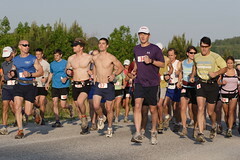 Proceeds from the race benefit the Wilderness Trail Running Association (a.k.a. “The Boonies”) for trail building efforts within the Cumberland and Southern Appalachian mountains.